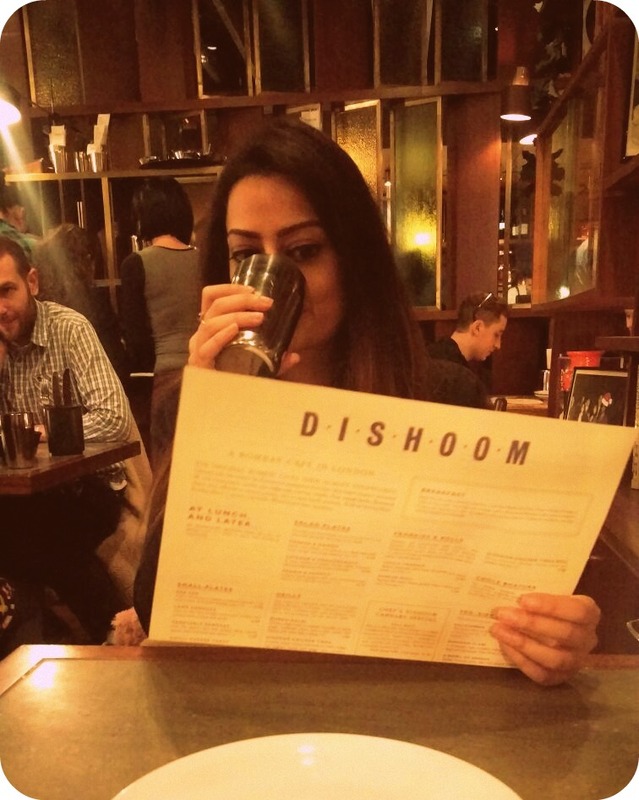 Since the moment I saw the ‘coming soon’ sign near Carnaby Street, I knew that my first time at Dishoom would have to be at their brand new location. I had heard rave reviews about the Bombay cafe inspired restaurant and had just never got round to visiting. After a good few shopping trips, late last month, my best friend and I took a detour to see whether it had opened up, and to our surprise, the doors were finally open. We hadn’t booked a table and had hoped we would be able to get ourselves a table, even though it was just before Christmas. As expected the restaurant and bar area were both extremely busy. Luckily, we were seated immediately on arrival and I knew straight away I was going to love this place. The ambience was better than I had expected, with the decor a rustic twist on vintage bombay – dark yet full of character. Our table was beside a bookcase which had lots of books and trinkets laid out on it. The waitress came over to introduce herself promptly and it was so nice to see a waitress who was enthusiastic about her job and genuinely welcoming. The menu was pretty extensive and full of traditional Indian foods. Being Indian myself I’m always reluctant to try eating at Indian restaurants as I’ll always end up comparing it to the food I have at home. I absolutely loved that they remained consistent throughout the entire menu and even the drinks were fully Indian, including lassi and bhang. Traditional Indian Bhang might be illegal in the UK today but I do love that they’ve featured it on the menu and even explained that “happy go lucky hemp” has been replaced with fresh mint. Brilliant! In India, as soon as you enter a cafe or restaurant you’re given some water and it brought such a smile to my face to see stainless steel glasses of water bought to the table before we ordered. After a whole day in and out of shops on Oxford street looking for Christmas presents, we were absolutely famished. Neither of us are huge curry fans so we opted for non curry options. 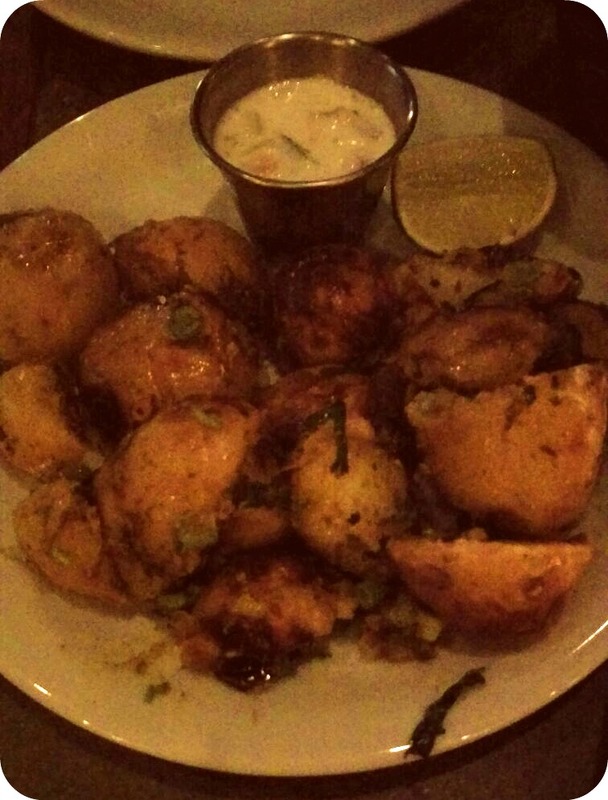 We ordered Far Far (Indian style colourful prawn crackers, except they’re not prawn flavoured), Chilli Cheese Toast, Dishoom Chiken Tikka and Gunpowder Potatoes. We asked for the food to come altogether, as I prefer eating my starters with my main and they were happy to oblige. The food, you guyssss the food was incredible! The flavours were amazing without being too overpowering. The chilli wasn’t burning my mouth off and the portion sizes were just enough. The prices are also very reasonable, so no complaints there. 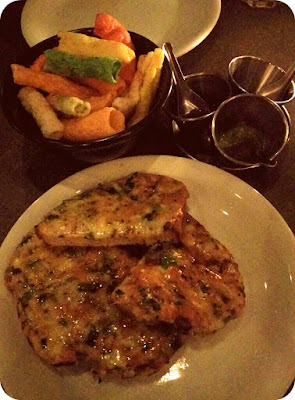 I was also impressed at how the food arrived in good time considering just how busy the restaurant was. All the chicken and lamb is halal across their locations which is another huge bonus for me. The thoughtful chef’s even cater for gluten free, dairy free and have a great range of vegetarian options. There’s something for everyone! If you haven’t been already, this is definitely one to check out. Visit their website here.